The following are his Christmas devotional readings for December 24 and 25 of this year. One day your heart will stop. That’ll be the end of your heart, but it won’t be the end of you. You’ll last for eternity — trillions of years. And God wants you to be a part of his family. If you celebrate Christmas without receiving the number one gift God has for you, you’re missing the point entirely. Acts 10:35 says, “It makes no difference who you are or where you’re from — if you want God and are ready to do as he says, the door is open” (The Message). Dear God, I know that when I die I’m going to give an account of my life to you directly. I confess I have ignored you. I know I have sinned against you, and I have lived by my plan, not yours. I want that to change, starting right now. I want to turn away from my sins toward you. If you gave me a Christmas gift and I never opened it, you would be disappointed. And it would be a worthless gift, because I don’t receive the benefit of a gift I never opened. Jesus Christ is God’s Christmas gift to you. 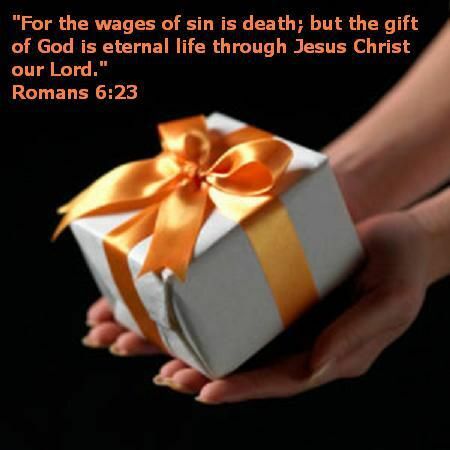 Yet some of us have gone Christmas after Christmas and never opened the best gift of all: God’s gift of salvation. Why even celebrate Christmas if you’re not going to open the biggest gift? It doesn’t make sense to leave unwrapped the gift of your past forgiven, a purpose for living, and a home in Heaven. God has made a way for you this Christmas to be right with him, and all you have to do is receive his gift of salvation. The Bible says, “By entering through faith into what God has always wanted to do for us — set us right with him, make us fit for him — we have it all together with God because of our Master Jesus” (Romans 5:1 The Message). Below is a prayer I prayed years ago when I stepped across the line and accepted Jesus. It’s a simple prayer. If these words express the desire in your heart, then pray them. Dear God, I’m scared, but I want to get to know you. I don’t understand it all, but I thank you that you love me. I thank you that you were with me even when I didn’t recognize it. I thank you that you are for me; that you didn’t send Jesus to condemn me but to save me. Today I want to receive the Christmas gift of your Son. I ask you to save me from my past, my regrets, my mistakes, my sins, my habits, my hurts, and my hang-ups. Save me from myself. I ask you to save me for your purpose. I want to know why you put me on this planet. And I want to fulfill what you made me to do. I want to learn to love you and trust you and have a relationship with you. I need peace with you, God, and I need you to put your peace in my heart. I need you to take away the stress and fill me with your love. Help me be a peacemaker and help others find peace with you and each other. In your name I pray. Amen.